I reckon you’ll agree with me when I say: Finding the best vlogging camera for yourself is quite tricky. That is why we have created a list of great cameras for vlogging. After researching online, I have shortlisted the top 10 vlogging cameras which can deliver quality video. Vlogging is something that has taken the internet by storm, and even though the concept of vlogging has existed for quite some time. I can assure you that it is something many people are entirely unaware of especially those who’ve just started using the internet the way it is supposed to be in use. For those unaware, vlogging can be considered a branch of blogging. However, instead of using your words to express yourself, you use videos. Vlog is also known as Video Blog. The videos can be taken on the best vlogging cameras and can be short, or long, depending on the amount of stuff you have to share, and you can take them in either first-person perspective. As we have not listed a single sony vlogging camera in the our list so I have created separate guide to buying the best sony vlogging cameras. Many people have taken up vlogging as their professional careers. Vloggers like Casey Neistat, Shane Dawson, PewDiePie, and Casper Lee have amassed millions of followers, and even a higher number of views. You can easily analyze the graph which shows the interest of vlogging over time. If you look carefully, starting a vlog (video blog) is not all that difficult, you need a good camera, a YouTube channel as well as constant upload of content that’s both refreshing, and engaging. Vlogging cameras are not a lot different from your usual cameras. However, since you may need to be on the move as well, you want to buy something that is small enough to be easily carried. With enough hardware to allow you to make good quality videos, as well as shoot good pictures if you prefer that. Our list of the best vlogging cameras is going to explore the top 10 best vlogging cameras that you can buy and help you to pick the best one out of the bunch with a detailed Buyer’s Guide. Great lens that is 24-100mm. The built-in ND filter is great. Comes with built-in Wi-Fi and NFC. 20-megapixel BSI CMS sensor for great stills and video. The rear touch screen flips up, making it great for vlogging. When it comes to the cameras, Canon has been at the helm for quite some time, something I can personally endorse. This digital camera features a high-sensitivity CMOS sensor combined with Canon’s powerful DIGIC 6 image processor. Upon receiving the PowerShot G7 X, there was much excitement in the air, because honestly, it is one of the highly revered vlogging cameras available in the market. PowerShot series has always been the one that caters most of the needs without being too expensive. It is something the majority of vloggers are going to prefer, or at least they will if they are trying to be on a budget. NOTE: There’s a new version of this camera available Canon Powershot G7 X Mark II. What makes G7 X the best vlogging camera with flip screen? G7 X is going to impress you with one of the most well-built designs available on a vlogging camera; it’s sturdy, feels premium, and most importantly, it’s a compact camera that fits in your backpack and even your pocket. I also love the physical controls that are available on the PowerShot G7 X, it is something significant in my opinion, as it is going to help you have full control over how you want to shoot images or videos. Key Features: Another great thing that I love about the G7 X is that it comes with some neat features like NFC, as well as Wi-Fi, allowing the users to transfer the images and videos with great ease. Lens: The PowerShot G7 X also comes with a pretty incredible 24-100mm (35mm equivalent) lens that can do well in a multitude of situations. Resolution and Sensor: You also get a 20-megapixel, 1-inch sensor that allows for some incredibly detailed photos, and more importantly, crisp videos. I believe that the Canon PowerShot G7 X is one of the best cameras for vlogging, but it is also essential for me to list down some of the downsides that I felt aren’t that big of an issue. For starters, the G7 X does not have a hot-shoe, and the autofocus system seems a bit old, albeit it works well. This digital camera shoots fantastic images, as well as videos; it is a compact camera, has the premium build quality, and physical controls. On top of that, it has needed features like NFC, and Wi-Fi. If you are okay with lack of a hot-shoe, and the fact that the autofocus system is somewhat dated, then I can assure you that the camera is going to be exceptional for your vlogging experience no matter where you decided to take it. According to the specifications, battery life of PowerShot G7 X is below average as the battery lasts for around 75 minutes of continuous shooting, or 210 shots. We are saying so because the average number of continuous shots in large sensor compact cameras is around 311 shots. It’s one of the best camera EVER! Canon G7X is amazing for videos. Why do Famous YouTubers love the G7 X? The lens quality is excellent regarding the price of the camera. Additionally, you get some fantastic features like time-lapse, slow-motion videos, a full 180-degree rotation flip screen, great autofocus. Some other famous YouTubers that used the G7 X are FaZe Rain, Pointless BlogTV. 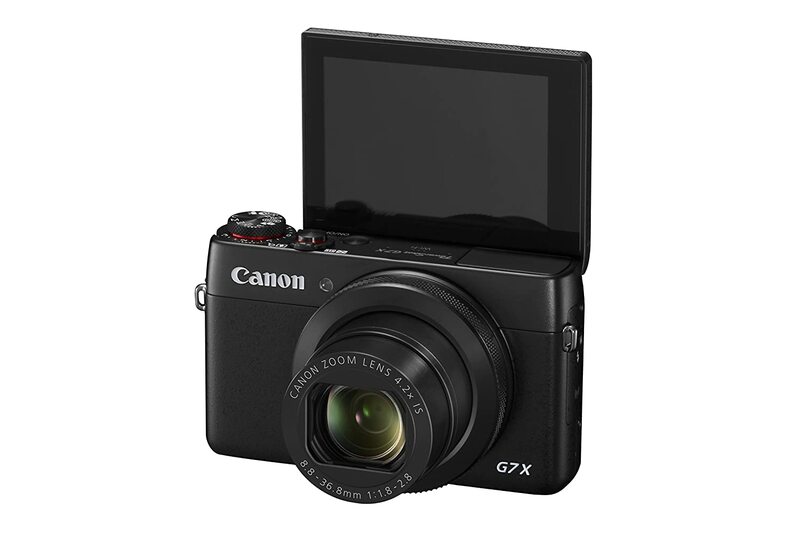 Canon Powershot G7X is one of the most compact camera that you can vlog all day with ease. From the refined metal body to the impressive quality of its results everything says Canon premium G-Series DNA. The PowerShot G7 X has been specifically designed for those who want uncompromising image quality and control from a pocketable camera. The Canon PowerShot G7 X is the best budget vlogging camera of 2019 with a flip screen that does more than just getting the job done. Overall it’s a great camera. The camera has Wi-Fi and NFC. Physical controls are a blessing. Lens is ample for plenty of situations. No hot shoe on the camera. The camera has built-in NFC and Wi-Fi. Continuous shooting of up to 8 frames per second. The 1.0 inch, 20.1-megapixel BSI CMOS sensor is great for vlogging. The 3.0-inch LCD monitor is great for vloggers as it tilts with ease, and gets the job done. If you think that the PowerShot G7 X is not enough for your need, but you still want something from the PowerShot series, then don’t worry as we do have an excellent option for you. The camera features 4.2x optical zoom and offers pretty excellent full HD video quality. It also has a fast f/1.8-2.8 zoom lens with a great 24-100 mm effective range. Canon’s PowerShot G7 X Mark II is one of the highly revered vlogging cameras on our list, and for a good reason. Before we begin, it is crucial to keep in mind that the original G7 X did not require many upgrades in the first place because it was already a beautiful camera. However, Canon did add some excellent features like the new DIGIC 7 image processor, and some changes here and there. Thanks to the new processor, this digital camera is an absolute beast when it comes to low light performance, the touchscreen is nicely implemented and can also tilt. Controls: The G7 X Mark II also provides you with loads of manual controls, making sure your photography experience goes completely unhindered. Resolution and Optical Image Stabilization: For the purists, the camera also can capture images in RAW format, the 20.1-megapixel sensor does come with optical image stabilization, making the low life shots even better than before. New Technology: The G7 X II has “Double Sensing IS”, which utilizes information from the picture sensor to diminish obscure caused by camera shake. Here’s the kicker: The Mark I shot constant Raw blasts at only 1fps frame rate, the Mark II would now be able to shoot Raws, JPEGs or both at 8 frames per second. The battery life of PowerShot G7 X Mark II is better than its predecessor. It can shoot up to 265 shots per charge which is still a mediocre performance for its class. What’s missing in Canon PowerShot G7 X Mark II? However, some downsides have made their way from the original into this camera as well; for starters, there’s still a lack of proper viewfinder to add in photography as well as videography. The Canon PowerShot G 7 X Mark II also has a screen that doesn’t articulate entirely, and while it is only a minor issue, for many people, it can create hiccups. Lastly, upon testing the camera thoroughly, I came to realize that the Canon PowerShot G7 X Mark II is not as good at zooming as I had hoped. Though, considering how vlogging does not require you to zoom in or out a lot, you should not have any issue whatsoever. In conclusion, the Canon PowerShot G7 X Mark II is a fantastic camera for vlogging. The Mark II has all the right ingredients that can make a vlogging camera useful, and it does not shy away from showing all those features either. Sure, there are some downsides, but they are probably not severe enough to impact the overall vlogging experience that Mark II is known for providing. The camera works fantastic in low-light. There are a plethora of manual controls. The camera supports RAW format shooting. Optical image stabilization is a treat to have. The touchscreen tilts, providing an excellent control. The zoom range is limited. You get 3 distinct 4K video options. Comes with a great kit lens for starters. The camera is compact, and the lenses can be interchanged. Share everything through the built-in Wi-Fi sharing option. Many times, I get a question that the best vlogging camera is usually costly, and out of budget for many people, and it is something to think about because the better the hardware is, the more expensive the camera is. However, the Panasonic Lumix G7 tried to beat that idea and offers something great and a solid contender against any entry-level DSLR in the market. 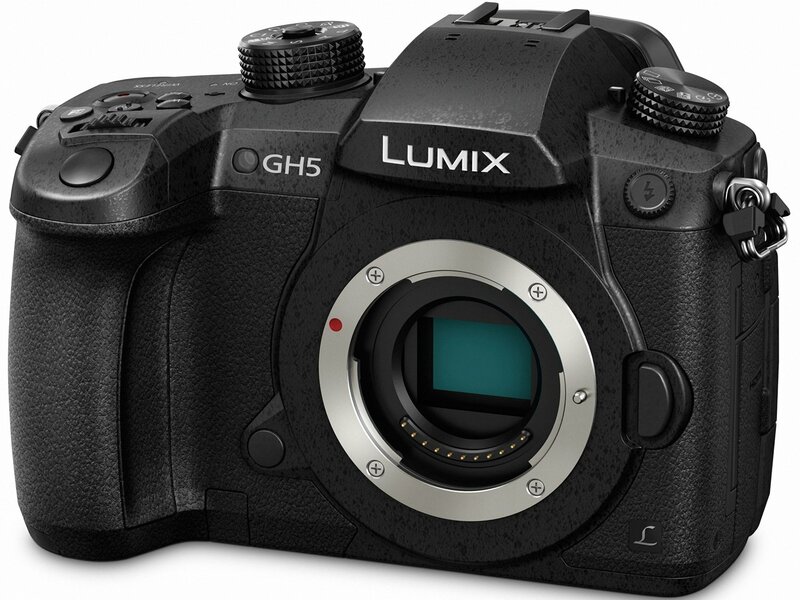 The Lumix G7 is a part of Panasonic’s mid-range lineup of G series cameras, however, with some advanced, and helpful videos feature that it has taken from the higher end models like GH4. For starters, the G7 is one of the few mid-range cameras to offer high-quality 4K video recording out of the box. Video Quality: I believe the high-quality 4K (UHD) video recording is not the only good thing about this camera. Controls: You also get plenty of physical control like twin control dials and also a lot of buttons and switches, allowing you to control how you are going to take a photo or shoot a video. A feature many manufacturers overlook entirely in several scenarios. Resolution and Sensor: The G7 offers a 16-megapixel MFT sensor that can take great looking pictures, and shoots decent video regardless of the resolution you are using. Viewfinder: For those who want a bit more technical detail, the G7 also has a 2.36-million dot EVF, something many people would prefer. The G7 also ditches the traditional viewfinder in favor of an electronic viewfinder, and while purists may turn away by this feature, I am pleased to point it out that the EVF works wonderfully well in all the situations and won’t be letting you down. 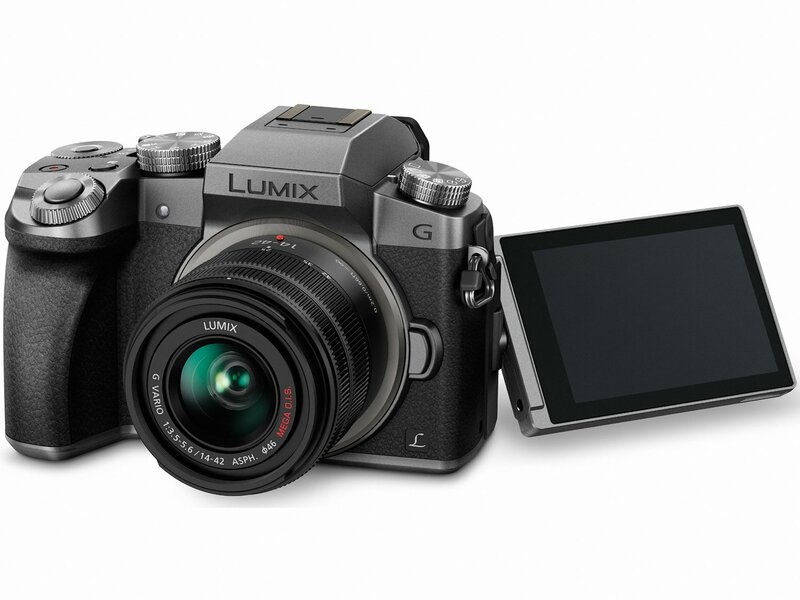 The Panasonic LUMIX G7 comes with several different accessory options which include an interchangeable lens. If you are looking for a wide angle lens for Panasonic Lumix G7, then I would suggest you choose from single lens or dual lenses. For starters, the entire build quality is entirely plastic, and in all honesty, may feel cheap as compared to some of the higher end cameras. The G7 is an excellent camera for vlogging, it records at high-resolution with the option to switch between them as well, and the 16-megapixel sensor works rather well in many other conditions as well. Additionally, the MFT sensor is brilliant, but, the amount of depth of field provided by the sensor is somewhat lower as compared to other cameras, but since you have to look close, it is not precisely that big of an issue. Panasonic Lumix G7 is an excellent entry-level DSLR-styled mirrorless camera for vlogging, and it gets the job done even if you want to do some photography as well. Just avoid the plastic construction, and you would be able to go. The camera offers much control. 4K video recording is a nice addition. The electronic viewfinder is fantastic. The 16-megapixel MFT sensor is excellent. The camera has plastic construction. The sensor is not exceptional with the depth of field. 7-frames per second shooting mode. Great, fully articulated touch screen. You can capture 60fps frame rate slow motion in 1080p. Share images and videos using the Camera Connect through Wi-Fi or NFC. 24-megapixel sensor with Canon’s proprietary dual pixel auto focus. If you are willing to spend your entire budget and want to spend money on a camera that is as expensive as it is good, don’t worry, Canon is got you covered. 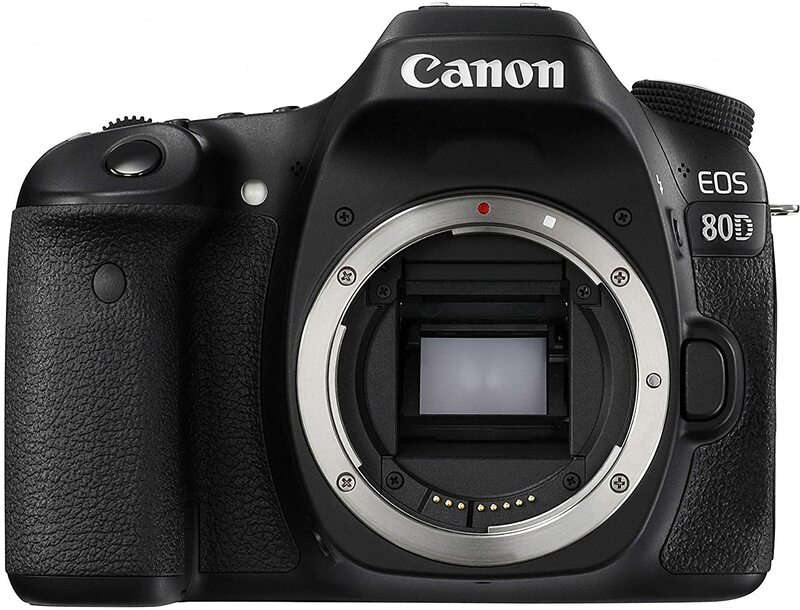 We are already aware of how the EOS series is one of the top ones, and taking charge is the Canon EOS 80D. The EOS 80D can be considered the master of all trades since it takes the best features from the previous cameras, and add an even higher amount of new features. This camera works even better and lets you shoot some stunning videos, and thanks to the large sensor, and a higher megapixel count, there is quite a lot of detail involved in the videos. Giving the vloggers something to rave on. Resolution: You get a fantastic 24-megapixel sensor that is capable of taking some stunning pictures with much detail. Video Quality: It supports 1080/60p recording and consistent self-adjust amid video. Screen: Canon has also done an excellent job at making sure that the EOS 80D boasts a beautiful screen; I find it gorgeous to look at, and extremely responsive as well. These features make it one of the best displays on any vlogging camera. Sensor: Another thing that I must point about the EOS 80D is that unlike the siblings, it does not use the same sensor, this one is packing a dual pixel sensor that makes it a lot better in almost all the shooting conditions. Autofocus: The camera also has one of the best and fastest autofocus system that I have seen. Body: The body is fixed against clean and dampness, the 80D has a polycarbonate outside which is more durable, scratch resistance is maximized and magnesium amalgam skeleton. The EOS 80D is undoubtedly a substantial upgrade over the 70D, all thanks to fantastic ergonomics, heaps of features, and a ton of controls making it an enthusiast grade camera both for vloggers, and professional photographers. Not all is as perfect though, there are some minor hiccups with the 80D, but the good thing is that they do not break the deal. Instead of using the full format, the camera opts for the APS-C format, something that is slightly lesser, but still very effective. The autofocus system is somewhat complicated and may require time to master, but I believe this is more of a subjective issue, then a primary objective problem that can hinder the overall experience of shooting videos for your vlog or your YouTube channel, or even taking pictures. If you think that the Canon 80D is a full frame camera, then I must clarify that it’s not because a full-frame camera would have a sensor 36 x 24 mm. Canon EOS 80D has an APS-C (22.5 x 15 mm) sensor. Famous fashion and beauty vlogger Aspyn Ovard use this camera for shooting her vlogs. Casey Neistat stated in one of his vlogs that he has bought around ELEVEN Canon EOS 80D’s and it is now his primary vlogging camera. There’s no doubt that the Canon EOS 80D is one very, very capable vlogging camera in the market, and it doubles up as a fantastic camera for photography as well. An exceptionally balanced camera for vlogging, the 80D’s primary interest revolves around usability. Sure, the minor issues might raise some eyebrows, but they are not too severe to create problems. Overall, it’s the perfect choice for full-time vloggers who are ready to invest in serious vlogging equipment. There are plenty of controls. The camera has a gorgeous screen. The camera offers a hefty list of features. The camera has one of the fastest autofocusing systems. The sensor allows fantastic videos and photos with plenty of detail. Autofocus is a bit hard to master. 19 point cross-type AF system. Continuous 7-frames per second shooting. Ability to plug in an external microphone. For years, Canon’s EOS series has been on the top of their food chain, and there are some pretty convincing reasons behind that. This lineup has some of the most excellent DSLRs you can buy. Before we go any further, it is important to tell you that you can use a DSLR as a vlogging camera with great ease as many famous vloggers are doing the same. Despite some of the bulkier models in the market, it is very doable and can result in some stunning footage. The camera we have on our table is the Canon EOS 70D, it is an upgraded version of the highly praised EOS 60D, and has some notable improvements over the younger sibling. Resolution: It offers a 20.2MP resolution, yet utilizes a “Dual Pixel CMOS AF” outline in which every pixel is parted into two independently coherent photodiodes, confronting left and right. Picture Quality: EOS 70D is phenomenal when it comes to taking pictures, the photos were wonderfully detailed and looked terrific regardless of the scene. Screen and Controls: The EOS 70D also has an excellent touchscreen, it’s well articulated, and offers pretty good control. Video Quality: The video side of things is also rather good, for instance, the autofocus in videos is excellent, and works without a glitch. The video quality even remains stellar. 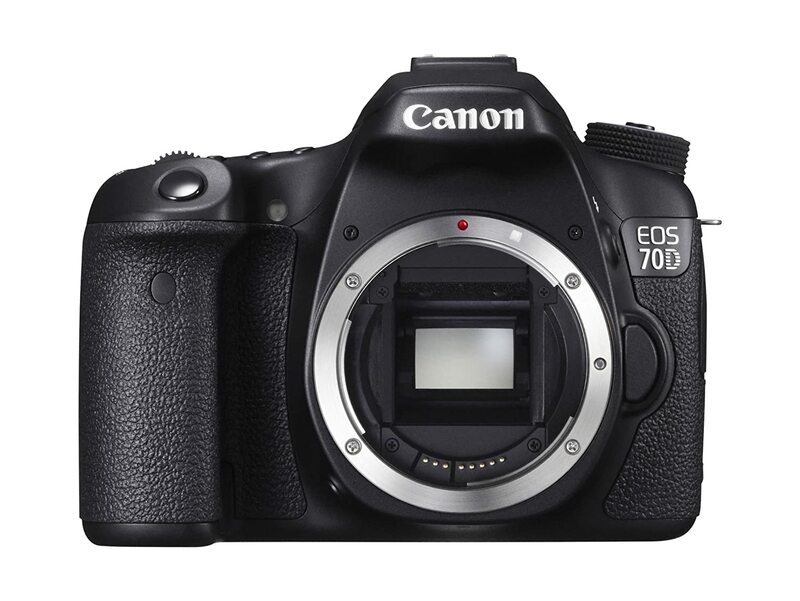 However, it would be unfair if we do not mention the negatives of Canon EOS 70D. What’s lacking in EOS 70D as a vlogging camera? The EOS 70D’s lack of headphone socket is not something that should bother many people, but for those who want this feature, it is not there. The 70D has a larger screen, a higher amount of single action buttons, a passive LCD screen, as well as command dial, and rear wheel that allows direct access to exposure settings, making things a lot easier. The EOS 70D is also faster than the 60D as well as 700D. A large number of things make the Canon EOS 70D an excellent camera for vlogging. The autofocus is one of the best we have seen, and the camera is fast enough to allow proper control and a great experience. The great thing of Canon 70D is the Live View feature which allows to vlog with more stability and accuracy. Some other famous professional vloggers that use EOS 70D are Aspyn Ovard, Bethany Mota, and Kian Lawley. The Canon EOS 70D is a fantastic camera for still photography, as well as vlogging; the pictures come out amazing, and the videos look amazing too. The sensor is fast and big. LCD screen is big and offers excellent articulation. Capture 180 frames per second in 1080p. Continuous shooting of 9-frames per second. Can capture 10-bit 4K at 30 frames per second. 20-megapixel micro four-thirds sensor with no optical low noise filter. Shoot at 4K/60 frames per second at 10-bit, or 4K/50 frames per second at 8-bit. I have carefully reviewed almost all the cameras on the list, but it is not over yet. The Panasonic Lumix GH5 is one of the high-end cameras from Panasonic, and it is also perfect for vlogging as it offers the ability to shoot stunning high-quality 4K videos. The camera also comes with an extensive set of features to boot. Starting right out of the box, I put this camera up for a test and decided to do some vlogging, and good lord, it was astounding. Even though I started shooting at different resolutions beginning from full HD that happens to be more common than 4K for many people. Video Quality: The video quality remains brilliant throughout the entire spectrum of resolutions; apparently, 4K looks a lot better than 1080p but let’s not forget that the 1080p looks terrific as compared to some other cameras that are common for vlogging. Electronic Viewfinder: The Panasonic Lumix GH5 comes with a big electronic viewfinder (EVF) which is bright, allowing you to see the vibrant colors without any issues, as well as allowing you to shoot videos, and take pictures properly. Touchscreen: The entire touchscreen interface is one of the finest, most polished ones I have seen in vlogging cameras, and it works wonderfully. Other Features: Panasonic has also done an excellent job creating the camera as it is easy to handle, and has one of the most durable construction that we have seen on a camera; it is reliable, easy to carry, and has excellent ergonomics. All of these factors make it one fantastic vlogging cameras. Picture Quality: Keep in mind that vlogging is not the only thing it can work well with; taking pictures with the GH5 is also a treat; everything is snappy and fast. You cannot miss great moments if you have a camera this good. Star outdoor YouTuber Levi Allen Leftcoast and Casey Neistat uses and loves Lumix GH5. If you are wondering which is the best vlogging camera for shooting 4K videos? Then I must say it is Panasonic GH5 has high-end features like it can shoot 4K @ 60fps frame rate internally. The video quality looks professional. And it has EVERY feature a pro would need. Overall the camera is way ahead of the class when you look at it from a vloggers perspective. It is among our favorites. The camera has a solid build quality. The touchscreen interface is fantastic. The camera has one of the best viewfinders. ISO range is not as broad. Good ISO range from 100 to 12,800. Continuous shooting at 5-frames per second. Canon’s dedication to its loyal customers and the camera industry is nothing short of admirable; the company has released some of the most excellent cameras and doesn’t show any sign of stopping. 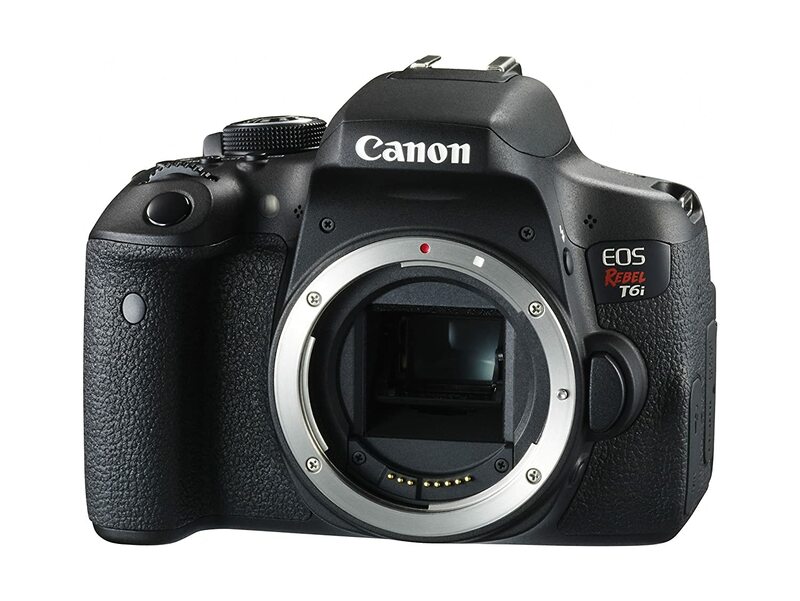 The Canon EOS Rebel T6i/EOS 750D is an excellent example of Canon’s vision. You can see the Canon Rebel T6i as a mid-range camera, but since it is from the EOS series, several features make it stand out. Resolution and Sensor: It uses the 24MP APS-C format sensor, allowing it to take pictures that come out beautiful, and well detailed. Screen: You also get a 3-inch LCD that works well, and has a pretty decent amount of articulation, and has incredible responsiveness. Autofocus System: The Rebels T6i utilizes a similar 19-point phase detection AF as the 70D, which speaks to a tremendous change in the 9-point AF framework in the T5i. For the purists, the Rebel T6i also comes with a dial that offers you perfect control on how you want to use the camera, and take pictures. I also like the fact that Canon is finally moving towards the proper use of technology by implementing Wi-Fi as well as NFC into the camera. Sharing photos and videos, as well as uploading them, or transferring them has become a lot easier than it used to be before. Upon testing the T6i for its video capability, I realized that the T6i does not shoot videos at resolutions higher than 1080p, and while it was a disappointment at the start, it came to my realization that for vlogging purposes, this is an excellent and optimal resolution. The details were there, and there was plenty of sharpness too, and even if you want to do photography, the camera is going to help you with that as it performed flawlessly on my trip around the city. During my testing, I realized that the viewfinder does not cover the entire screen it provides around 95 percent of coverage. It is nothing deal breaking, but I should be mentioning it. I also noticed how the camera is in dire need of a quicker way of setting autofocus point. Once you reevaluate the T6i after the concerns, you get a brilliant camera for vlogging as well as still photography. A camera that can easily create a spot for itself in the list without having to fight the heavyweights. The T6i is an also competent performer in both videography and photography. The camera comes with Wi-Fi and NFC. One of the most excellent LCD screens we have seen. The 24-megapixel sensor is fantastic for photography, and videography. The viewfinder does not cover the entire screen. Allows you to shoot time-lapse videos. Comes with waterproofing of up to 33 feet without a case. Fisheye Lens: Ultra-wide angle lens that covers horizontal/landscape view. Ability to shoot stunning 4K videos, with the ability to get 12-megapixel still photos. When it comes to action cameras, and cameras that are mainly for vlogging, GoPro has led the charge for as long as I can remember. Their cameras are impressively small, but at the same time, have some of the best hardware you can find on a camera. Even though Hero 5’s marketing team markets it as an action camera, it should not come as a surprise that it serves well to people who want to make vlogs using the camera. You can also stream live video from your GoPro to top social media platforms like Facebook. Key Features: The GoPro Hero 5 Black supports 4K recording, still photography, as well as the ability to shoot hyperlapse, and slow-motion videos if you feel the need. The Hero 5 also has electronic image stabilization which works well, and the dual microphones are perfect for recording audio with a good amount of detail in it. Video Quality and Frames Per Second (fps): It can record 4K at 30fps frame rate, as well as other resolutions on even higher frames per second, making it top of the line. Are GoPro HERO5 Cameras Waterproof Without a Housing? It is impressively small, as well as rugged, and without the waterproof housing, it can stay in 10-meters (33 feet) deep water with great ease. Some vloggers record videos even underwater so having a waterproof body is a plus. The GoPro Hero 5 packs a plethora of functions that I think are amazing as the features make it an excellent camera for still photography as well. 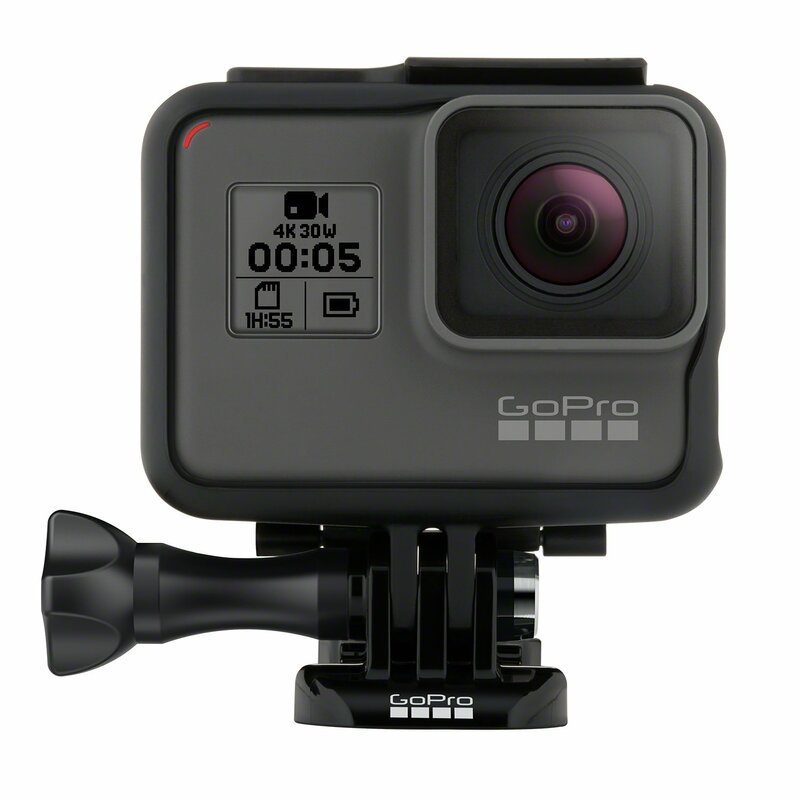 GoPro has also worked on the design to make it smaller, better looking, and even more rugged. Whats lacking in GoPro Hero 5 Black? The Electronic Image Stabilization (EIS) does not work when you start recording in 4K, the older GoPro batteries are no longer compatible either, last but not the least, the touchscreen responsiveness is not up to the par. These shortcomings do not hold a candle to the greatness of the GoPro Hero 5, and there are no issues in usability. The GoPro Hero 5 Black is undoubtedly one of the best vlogging camera that is going to serve you well regardless of the type of vlogging that you intend to do. Sure, the small size may make you wonder if you are going to get your money’s worth, but overlook that, and you have a vlogging camera that’s giving you more than what some significant cameras are offering, and that too at a lower price point. It is a bargain. The GoPro HERO5 is a plus for action, adventure, sports and moto vloggers. Fantastic video quality with high-resolution. Waterproof up till 10-meters without the case. The touchscreen responsiveness is subpar. Has a weather sealed body. Ability to capture RAW photos. 24 times optical zoom with a fixed aperture of F2.8. Finally, we are looking at the last camera in the list, the Panasonic Lumix DMC-FZ300, if you feel that the name certainly feels tricky, don’t worry, the sentiments are quite similar. However, let’s not let them come in the way of the actual review because that would be unfair. The Lumix DMC-FZ300 is bridging the gap between some cameras released by Panasonic. However, the good thing is that it still doesn’t let the others overshadow it in any way. Lumix DMC-FZ300 offers excellent video quality, meaning that bloggers are going to rejoice. The Lumix DMC-FZ300 also offers a plethora of shooting options that you are going to use. Sensor: It is even more impressive after you get to know that the sensor is not the biggest we have seen on the market, it is a smaller sensor, but the performance remains consistent in both videos, and photography. The small sensor also allows the camera to be lightweight, and compact. Body: The body of the Lumix DMC-FZ300 is weather resistant, meaning that you can do some vlogging outdoors as well. Just don’t throw caution to the wind because it does not say weatherproof. NOTE: Panasonic Lumix DMC-FZ300 is Splash Proof (Not Waterproof). 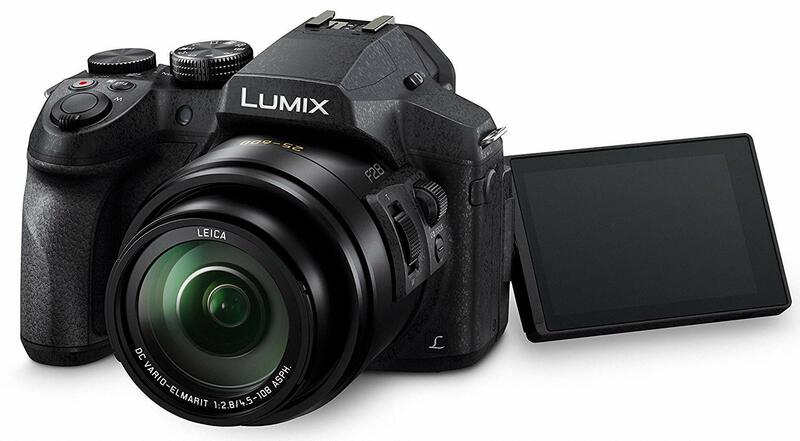 Video Quality: Lumix DMC-FZ300 shoots 4K/UHD video at 30p which looks stunning. The footage easily makes it one of the best vlogging cameras in the market that a moment, and my recommendation. Although upon testing several cameras throughout my tenure has allowed me to use some of the complex ones as well, I still can’t shake the fear of picking up the camera only to realize that the navigation is going to be a bit tricky. Such is the case with the DMC-FZ300, especially if you are comfortable with leaving everything on auto, and just going by your business, and not paying attention to other details. Luckily, it is rather easy to master, so you should not face any issues whatsoever. The camera also lacks a headphone jack, but in all honesty, it did not break the experience while using it since the use case scenario is somewhat rare. I’d still say that the Panasonic Lumix DMC-FZ300 is one of the best vlogging cameras you can buy in the market at this moment. Easy to handle build quality. The camera has a plethora of controls. Full HD video recording with stereo sound. Built-in wireless capabilities for easy connectivity. 16-megapixel CMOS sensor tuned for low light performance. 38-times optical zoom, along with 76-times dynamic fine zoom. Nikon has been Canon’s biggest competitor for a long, long time. Both companies have been in a rivalry, and we have seen them release some impressive cameras. However, I am not here to compare them both as this is not what the review is on. The Nikon COOLPIX L840 is sitting at the table. The L840 is not much different when it comes to the L830 from the previous year. However, I do know that the majority of upgrades it has received are under the hood, and honestly, the looks did not need much work, to begin with. The vloggers continuously have to exchange files and videos, so this feature is excellent. NFC blending is additionally present, making it a doddle to set up a remote association with an NFC-empowered savvy gadget. Now considering how I am reviewing it as a camera whose primary use is going to be vlogging, picture quality did not matter much, but if you want to know, it is a pretty decent camera that is disguised as a DSLR but has a smaller sensor. The pictures come out clear, and well detailed, but not of the best quality. The video is a different story; the L840 is by no means an enthusiast grade camera, it shoots videos at HD and full HD, and if your primary concern with this camera is vlogging, then I cannot say if it is going to do you any wrong. Upon testing the camera with some vlogging, the results came out promising. The video had enough detail as well as clarity to quickly make this one of the best vlogging cameras, and the best thing is that you do not have to go into much depth to get good videos out of the camera. I believe the best camera is the one that can be used right out of the box, and L840 does the job. In simpler words, the Nikon Coolpix L840 may be the most candid camera to use on the list; it is evident enough that its primary purpose is vlogging and works well in that. However, it is not for everyone since the use case scenario revolves mainly around the vlogging, and I am okay with it. While there is a lack of some of the additional features we have come to see, it gives back by being priced handsomely, as well as by providing some great footage in a majority of lighting scenarios with great ease, and no hiccups. It may not be the most powerful, and feature-packed camera, but it gets all the other things right that is necessary for a vlogging camera, and that is what I believe is important. The camera has a pretty good video quality. Although anyone can start a vlogging career just by picking up a camera, shooting videos, editing them, and then uploading them, it is essential to know that if you want your audience to be engaged and interested, you should buy a camera that can represent you like that. Yes, quality content and sound editing also play a huge part, but let’s not forget that a device on which you are going to be shooting all the videos is also an essential factor to take into account when you are planning on starting your vlogging career. After all, you cannot make videos using your laptop’s webcam, and call it vlogging; beauty attracts the audience, and in the continually evolving vlogging scenario. People want vlogs that look amazing and are edited that way as well; this is the main reason why buying a good vlogging camera is so important. Sure, it may have been different a decade ago, but things have changed drastically, and if you do not have the proper equipment, you are going to be able to please the spectators that quickly. We are not asking you to splurge all your money, just enough to buy a good vlogging camera. If you are searching the market for the best vlogging camera, it is going to present you with many choices. While having options is a good thing, it can also end up being overwhelming if you have not had the experience of buying a vlogging camera before. If I am, to be honest, vlogging cameras are almost the same as your standard point and shoot, DSLR, or an action camera. The only exception here is that the vlogging cameras heavily rely on just how good they are at shooting videos. If you are planning on starting your vlogging career, and don’t know where to start, this essential buying guide is going to help you make the most out of your time and money. The guide tells about the more important thing you should look for in a good vlogging camera. Considering how you are going to be shooting vlogs with the entirety of time spent with the camera you are about to buy, you need to make sure that the video quality is the most important thing you consider when purchasing a vlogging camera. You must also remember that just because a camera has a higher megapixel count does not mean that the video is even going to look fantastic. So, it is only fair that whatever vlogging camera you buy has excellent video quality because you are going to be shooting videos with your camera. The standard resolution is 1080p. However, several vlogging cameras on the market shoot at 4K too, the vital thing you should know here is that 4K means a larger size of the video, but it also means better video quality. It is a universal statement that the best camera is the one that you possess, and keeping that in mind, if a camera is not portable enough to carry around comfortably, then there’s no point in buying it. The DSLRs are usually bigger than other cameras due to the hardware that goes into them. Mirrorless cameras are smaller since there’s no real mirror present in them, and the point and shoot cameras are even smaller and more comfortable to carry. With all that said, I would personally suggest you buy a point and shoot since most of them are good enough to shoot 1080p videos without losing the quality. Mirrorless cameras are expensive, but if you can afford them, then they also make up a fantastic option and that is why we have included the Panasonic Lumix G7 in our top 10 which is also a mirrorless camera, offering 4K (Ultra-High-Definition) video recording. Lastly, if you are okay with carrying a DSLR around with you whenever you are on the move, you can also invest in a DSLR that is going to cost you less than the mirrorless camera comparatively. If you are interested in DSLRs then you take a look at some of the best DSLR cameras of 2019. Another important thing that you need to consider while buying a vlogging camera is some features that you are going to be aiming at. Generally, the higher you pay, the more amount of features you get, but what you need to know is whether or not you are going to be using all the features there are. From my personal experience with vlogging cameras and cameras in general, I can tell that OIS (Optical Image Stabilization) is known as one of the most important features that you should look for in a vlogging camera. Having this feature drastically improves the low light performance, and reduces blur as well. The PowerShot G7 X II has “Double Sensing IS”, which deploy information from the picture sensor to diminish obscure caused by camera shake. Another important characteristic that you need to look for in a vlogging camera is manual controls. However, this feature is more important on the image side of things since. Manual mode is one of the main settings on your camera, and it lets you manually control shutter speed, aperture, and ISO. Still, it is nice to have manual controls in a vlogging camera; that way; it becomes multi-purpose for you. A good EVF (electronic viewfinder) is also critical if you are buying a vlogging camera, and considering how it has become a pervasive feature to have, just make sure that viewfinder is big enough, and offers an excellent resolution that can reflect the real quality of your videos. For instance, the Panasonic Lumix GH5 comes with a big dazzling electronic viewfinder (EVF), allowing you to see the dynamic colors. Weather-resistant body is another important feature that you should be looking for, this is going to ensure that if you want to take your vlogging camera out on the trip, it serves you well, and even if it starts pouring, the camera’s hardware does not get damaged. Cameras like GoPro Hero 5 already have weather resistant/waterproof bodies, but it is essential to keep in mind that not all cameras come with this feature. Last but not the least, I prefer if my vlogging camera comes with an internal microphone, that way, at least I am not going to have to carry an external microphone with me everywhere I go. You will be astonished to know that audio quality is more important than video. Cameras like GoPro Hero are often equipped with multiple microphones, making it ideal for vlogging. The truth is that sound quality is more important for video than most folks realize, so ideally you should try to choose a vlogging camera that has a microphone port so that you can plug in external microphones for better sound quality. Almost all compact digital cameras do not come with a microphone port because it’s considered as a premium feature. If you use a good external microphone, it can dramatically enhance your vlogs because it will be able to produce far better sound quality. Many people tell me how I do not need a good lens for vlogging because it is just a video, and people are going to be too busy paying attention to the detail. I do not believe it works like that; if you have seen some of the vlogs made by really talented bloggers, video quality is consistent. Now, this is where a good lens comes in, while most vlogging cameras have lenses already if you want to make sure that you, as a vlogger, are the subject of the entire video, then investing in a telephoto lens is a good idea. Telephoto lens adds optical zoom, blurring out the remaining background. You can check out How a telephoto lens works. Since the camera is going to be used by you, it is imperative for you to reflect upon your personal needs. Sure, everything that I have talked so far does add up to a good buying experience, but if you are not shedding any light on your own needs, then we cannot be sure how the experience is going to be. If by any chance, a vlogging camera does not meet your requirements or satisfy your personal needs, there’s no reason to buy that because the videos it is going to give you is not going to be enough. I would personally put all the features aside first, and then look at just how decent the vlogging camera is. Looking for some more canon vlogging cameras? Check our list of best canon vlogging cameras. In case you think we missed a good vlogging camera, let us know. Obviously, the Panasonic GH5 is just an amazing vlogging camera. The videos are crispy and looks professional. Overall a perfect guide. I am using Canon Powershot G7 X, the camera is just amazing for vlogging and I am pretty impressed till now. You’re welcome, Gracia. More cool guides on the way. As I’ve mentioned before in my guide the Canon PowerShot G7 X will suit you the best if you are at beginner level. I am looking to start a Youtube channel and I am on a budget. I want to start with a less expensive camera to see if I keep up with the channel the way I intend to. What do you recommend? I will be filming a fashion clothing, “ballin’ on a budge” type series, so detailed images is crucial as well as some of the video’s need to have voice over’s and video’s within the main video. Please help! Hi. What type of good camera do you suggest for the budget below $400 for vlogging? Thanks. I personally use Canon G7 X, can you give me suggest on Panasonic Lumix G7 for my vlogging? One of the best review I have ever read, very informative and interesting as well. I’m a beginner youtuber, and I want to start YouTube Video. But First of all we need a best camera. I found a best cameralist. But I’m confused which one is the best for me. Here is some best camera list. please help me which one is the best for my youtube video under $500. I’m a beginner vlogger and blogger, I also want to make a new youtube vlog channel.I was searching the best camera for vlogging then I came to your site. Hopefully, you will also write about the upcoming cameras for vlogging. 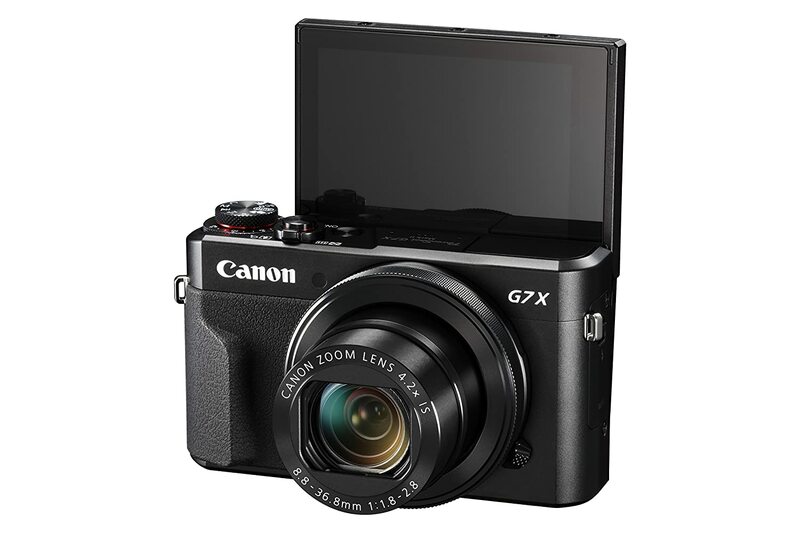 Glade to hear that you are also a vlogger, as I have mentioned you can go for Canon Powershot G7X, it’s is the best vlogging camera of 2019 with a flipscreen to make your tasks much more easier. Or you can also check out it’s latest version Mark 2. If you are a PRO vlogger then I would recommend you to go for Canon 80D. It will be a perfect choice. I am new to vlogging and i am looking for a professional vlogging camera under $500. If your are new to vlogging and looking for a professional vlogging camera under $500 mark then I will suggest you to check Panasonic Lumix G7. What makes Panasonic Lumix G7 the best 4K budget vlogging camera under 500$? 1. 4K (UHD) video recording is out of the box. 2. 16-megapixel MFT sensor that can take great looking pictures. 3. Lightweight (A PLUS FOR VLOGGERS). 4. Great buy considering the cost/feature ratio. Thanks for this amazing review of vlogging cameras nicely written. You’re welcome, Shamveer. Glad you enjoyed it. Seems like you worked a lot to give this list… but i need the best camera for YouTube videos under $200…Any idea? 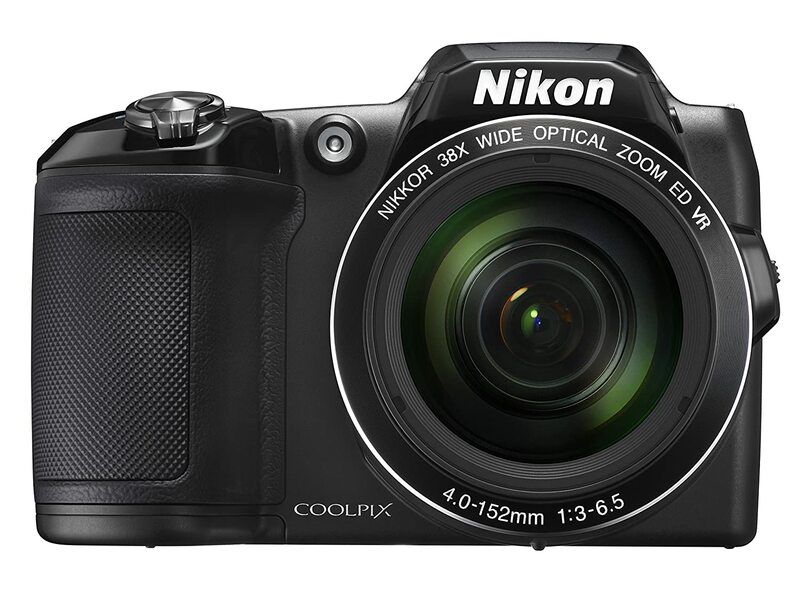 Talking about the best camera for YouTube under $200 mark on our list is Nikon COOLPIX L840. Why is Nikon COOLPIX L840 Good for Vlogging? 1. Max image quality is good (1080p30). 2. Different FPS rates while vlogging. 3. Above average battery (A PLUS FOR VLOGGERS). Vlogging cameras are the need of everyone as most people love making videos on YouTube and your article will help them to choose the best one. I’m a beginner at YouTube, and I want to start YouTube Channel. But First of all, I need the best camera for myself. Came to Stellar10 and I found the top 10 best vlogging camera list of 2019. But I’m confused which one is the best for me. I would like to thank for the efforts you have made in writing this review post…Great website! Thanks for sharing. Most of the recommended cameras are very expensive. Nevertheless thanks very much for the info. Thanks a lot for your informative post. I love vlogging, and I usually make use of my iPhone 7, but I would like to start using a camcorder or a vlogging camera now. I’m looking for one that is reliable and produces quality HD videos and in the $300 – $400 price range. I’m using it mainly for personal every day vlogs and would occasionally upload on YouTube or my blog, what would you recommend? Thank you. Also for any of your recommendations, would it also be able to take good pictures? Amazing reviews man! These vlogging cameras are just amazing. Thanks for recommending the Canon Powershot G7X for the low budget folks. It has a flip screen which is a plus for vloggers like me LOL. Thank you so much for providing this awesome guide about the finest cameras for vlogging in 2019. Keep publishing this sort of informative review articles. Thank you for the article. You helped me to understand the choice of camera for my vlog on YouTube. And thanks for the tips at the end. Hi Tahir !it is a great article!! we have a question please help me ? Does the PowerShot G7 X shoot in RAW mode? Someone says it does but the camera slows up in burst mode, also some other person say it does not shoot in RAW mode. Thank you for the article. You helped me to understand the choice of camera for my vlog on YouTube. And thanks for the tips at the end. Nice Blog. Wow man great content. Truly awesome. Thanks for the insightful article on video blogging! Your answer is so informative to find out the best Vlogging Camera for my personal use.